The latest film in Harry Potter writer J.K. Rowling's Wizarding World franchise, Fantastic Beasts: The Crimes of Grindelwald, is set for a simultaneous release in Chinese mainland and North American theaters on November 16. A prequel to the Harry Potter series and a sequel to 2016's Fantastic Beasts and Where to Find Them, the Warner Bros film tells the story of how Magizoologist (a magical creature expert) Newt Scamander and his magic school teacher Albus Dumbledore work together to save the world from the dangerous dark magic wizard Gellert Grindelwald. Cast members Eddie Redmayne, Jude Law, Katherine Waterston and Ezra Miller took to the red carpet to attend the film's China premiere in Beijing on Sunday. Numerous Chinese fans dressed in wizard robes and striped scarves called out the stars' names as they walked by. "I can't tell you how wonderful it is to be back… some of the greatest wizarding fans are from China," said Redmayne, who plays Newt Scamander, at the event. The Oscar-winning actor came to Beijing two years ago to promote the first Fantastic Beasts movie with Waterston and Miller. Already familiar with - and a fan of - his Chinese nickname "Little Freckle," Redmayne noted that he was actually "not that keen on" his freckles when he was younger, but after learning about his Chinese nickname he has "embraced the freckles." One of the new film's biggest highlights is the debut of a new Fantastic Beast species from China named Zouwu, which is described by Redmayne as "a massive cat" that can travel thousands of miles a day. "It [Zouwu] has those massive, expressive eyes when you play with it and it turns into the cutest cat in the world basically," said Redmayne, making faces along with Miller to imitate the mystic cat's expression and bringing fits of laughter from the audience below the stage. 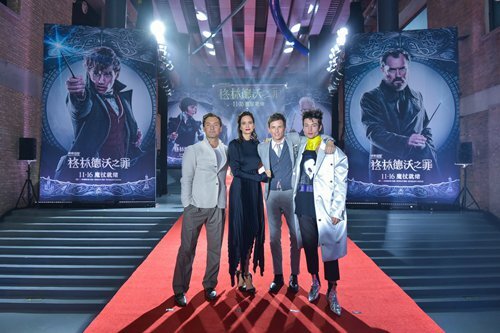 In an interview before the premiere, Miller told the Global Times that he, as a long-time fan and practitioner of Chinese martial arts, added elements of tai chi into his moves while playing Credence Barebone, the host of the dark magic power known as Obscurus. Talking about the role, a young man who becomes a destructive dark wizard mainly due to the abuse he experienced from his foster mother since childhood, Miller said, "To me, it is, at its essence, a story about surviving abuse… you put your power in the shadow, the shadow power comes in and occupies you - that's the metaphor of Credence." Law, the newest member of the cast, told media at a press conference on Sunday that the most interesting moments he experienced shooting the film were with Redmayne. "Because in the story, really 90 percent of my work is with Eddie!" said Law, who plays the young version of Dumbledore that decades later appears in Harry Potter series as the wise, grey-haired headmaster of the Hogwarts magic school. "They have a very lovely relationship in the story, Newt and Albus, it's teacher-student but really it's also mutual respect between two people battling for the greater good," Law said. Moreover, Dumbledore's "intimate and intense relationship" with Grindelwald, as Law put it at the premiere, is also a spot of interest for the franchise. Rowling has portrayed the two as gay lovers, but how the movie is going to showcase their relationship has yet to be unveiled. Waterston - who stars as Tina Goldstein, the MACUSA (Magical Congress of the United States of America) officer who develops a romantic relationship with Scamander in the first film - said the relationship between the two "sort of stalls" in the sequel. "Between the first film and the second film, they've been in a long-distance relationship of sort - she is in New York and he is in London, and along the way she gets words saying that he marries someone else but he hasn't… there're a lot of misunderstandings that carry them quite away in this film," Waterston told the Global Times in an interview before the premiere. Talking about working with Redmayne, Waterston told the Global Times that the actor's physical strength amazed her. "We have to run a lot and we ran together holding hands in the last film and Eddie is like a sprinter and I am like a long-distance runner, so I came around for a long time but he can go from standing still to very fast; so every time that we have to run together, when we're standing and waiting to go and I am trying to warm up or everything, and they call 'action!' and he goes so fast right away and when I try to catch up with him, I have to pull up the muscles in my legs, so they get really sore," Waterston said, laughing.